Michelle Reinhardt, BA, PharmD, BCPP is a Board Certified Clinical Pharmacist Specialist in Psychiatry. She received her Bachelor of Arts in Criminal Justice Pre-Law at the University of Nevada, Reno and graduated with her Doctor of Pharmacy from Roseman University in Henderson, Nevada. She completed a PGY1 residency in Clinical Pharmacy at Billings Clinic and a PGY2 residency in Psychopharmacology at The University of Texas at Austin. After completing residency, she joined Billings Clinic in August 2014. 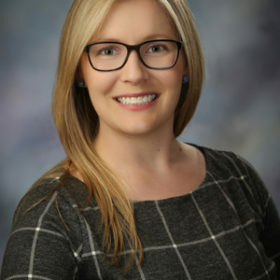 She works collaboratively with psychiatric providers to develop evidenced-based, patient specific medication regimens for patients with mental illness and chemically dependency on the inpatient adult and child/adolescent psychiatric units, psychiatric stabilization unit and psychiatry consult liaison service. She has been part of Project ECHO Billings Clinic since its inception and participates in the Integrated Behavioral Health, Medication Assisted Treatment, Pediatric Mental Health, and Department of Corrections Duel Diagnosis ECHO clinics. She has been actively involved in education of pharmacy residents and students as well as medical, physician assistant and nurse practitioner students.